for hiking, horseback riding, and mountain biking . 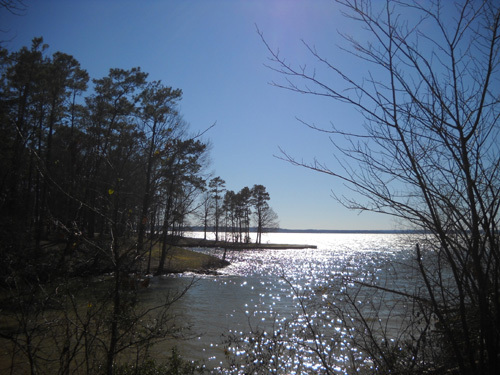 . ."
Compared to Huntsville State Park's 210-acre Lake Raven, which is also dammed, Lake Livingston looks like an ocean from the shoreline! It's pretty big. 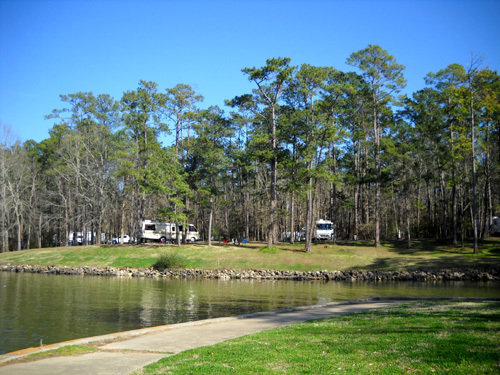 This relatively small state park about 70 miles north of Houston contains only 635 acres of land but has quite a bit of scenic shoreline to draw visitors who like to fish, participate in any number of water sports, or just relax and enjoy the view. We were one of the latter. I imagine it's a popular place for residents from the metro area and nearby towns to cool down in the hot, humid summer weather. Although some days in February are sunny and warm, winter is not the time to enjoy Lake Livingston State Park at its finest. Winter is the rainy season and freezing temperatures are not out of the norm. Unfortunately, our first trip to the park (in mid-February) was more cold, wet, and gray than sunny and warm. That's not the park's fault, but our poor timing. Fortunately, the two or three sunny days we got shed a much better "light" on the park so we didn't come away with totally negative feelings about it. The weather wasn't any better at Huntsville State Park about fifty miles to the west. The big difference is that the terrain is hillier and the soil drains much better at Huntsville. A park maintenance guy told us Lake Livingston got an unusual amount of rain in January and early February and the ground was just too saturated to continue to absorb it. 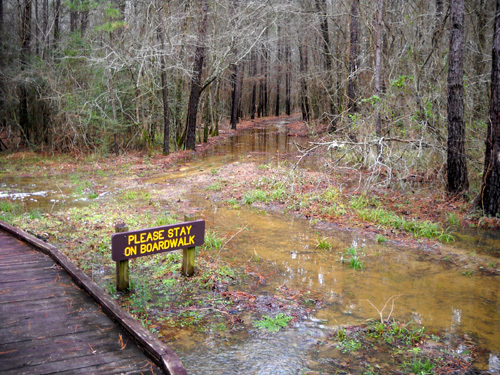 We were very tired of muddy trails and standing water in the campground by the time we left Lake Livingston and returned to Huntsville. I explained in the last entry how we ended up camping at Lake Livingston SP for a week in the middle of a five-week stay at Huntsville. We don't totally regret our decision. 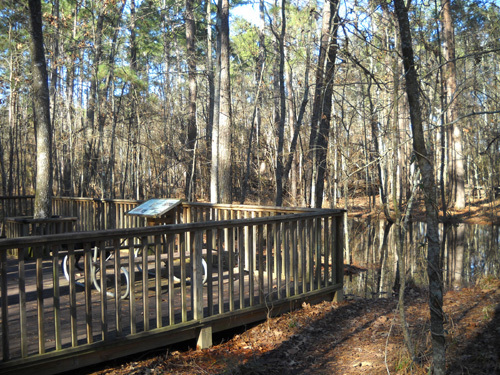 We got to explore part of another Texas state park (the parts that weren't too muddy) -- and we gained a new appreciation for Huntsville SP! 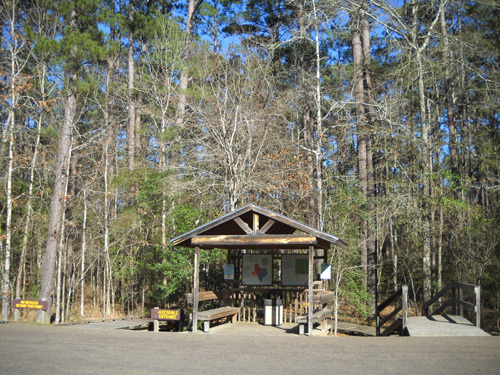 There is no video on the park website as there is for some of the other Texas state parks but you can see a map of the park at this link. It shows the campgrounds and trails, too. 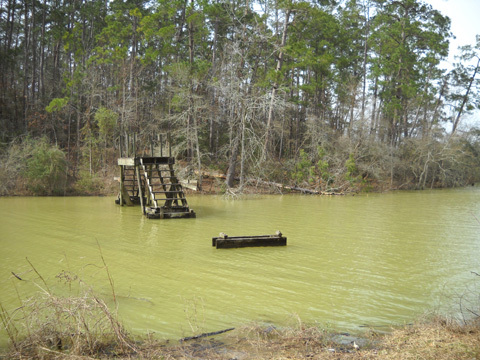 Lake Livingston was formed in 1968 when an earthen dam was built on the Trinity River to flood a fertile valley in southeastern Texas to form a large reservoir. The 710-mile river enters the lake from the northwest and flows out the southeastern end to Trinity Bay, part of Galveston Bay, and on to the Gulf of Mexico. We drove near the dam on our way back to Huntsville. 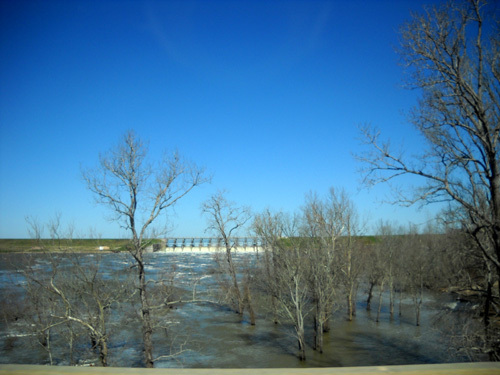 Wow -- the river below the dam (in the foreground of the photo below) looked quite flooded! 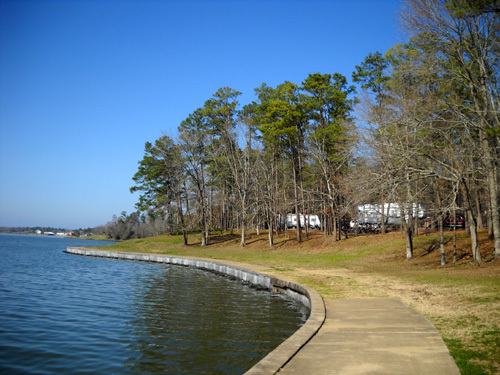 The land for the state park was acquired by warranty deed and from private owners in 1971 and opened to the public in 1977, according to the Texas Parks & Wildlife Department's (TPWD) web page for Lake Livingston State Park. 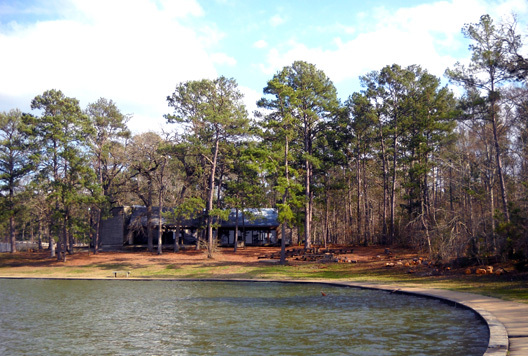 The park is located on the southeastern shore of the lake near the ghost town of Swartwout, which had a steamboat landing on the Trinity River in the mid-1800s. Now the closest town to the park is Livingston, about seven miles NE of the park entrance. It is described as a trade center for the prosperous lumber and agricultural businesses in the Trinity River Valley. 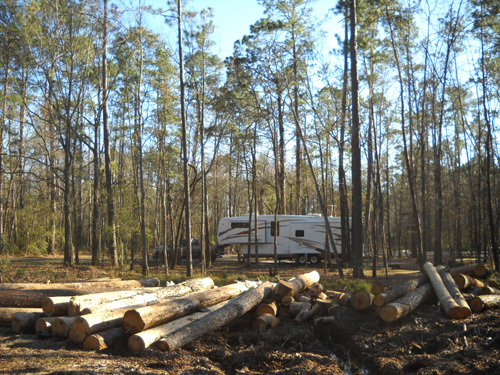 Livingston is also home to the Escapees, a club that is popular with full-time RVers, many of whom use Texas as their legal residence. 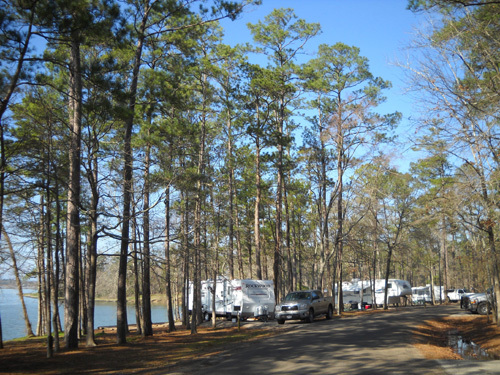 There are numerous private RV parks in the area around Livingston and the lake to accommodate these folks when they return to their "home base," as well as visitors who enjoy fishing and boating on the lake. Livingston was convenient for some but not all of the services we wanted while we were at the park. It has a super WalMart and a Lowe's store, which is pretty good for a town of fewer than 5,000 year-long residents. Jim was happy to find a What-a-Burger franchise (sometimes he's just gotta have a burger!). There is no YMCA or Sam's Club anywhere near and none of the three laundromats were as nice as the one we use in Huntsville. It was fine for a week, though. group tent and trailer sites, multi-use campsites with hookups, and an overflow area near the horse stable at the far end of the narrow park. 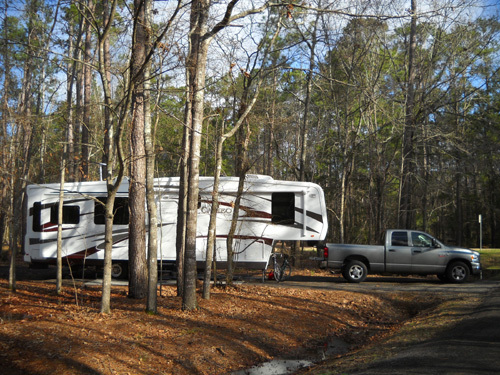 When we made reservations the week before our visit, all but one site in the four RV campgrounds was already booked for the President's Day holiday weekend. 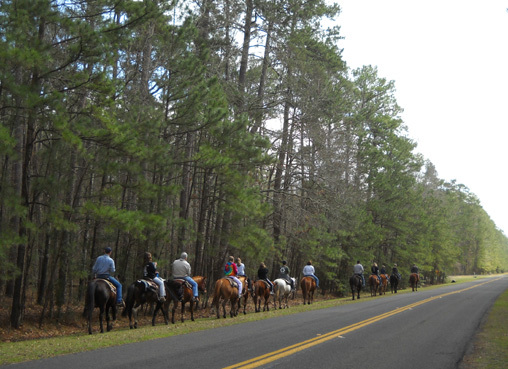 Our reservation was for the Hercules Club Loop, which has smaller sites than the Youpon, Red Oak, and Piney Shores loops. Hercules is used more for tents and pop-up trailers. Since we arrived on a rainy Monday afternoon, we got our choice of sites in Hercules, which was a good thing considering it was about the only site we could fit in! Besides the small sites, the main thing that struck us as we drove through the campground was all the water standing around. It was a swamp! This entire park is much flatter than Huntsville and its soil was completely waterlogged by the time we got there. Except for the concrete "driveway" for our camper, the rest of our site was unusable the entire week we were there (below). So were most of the other sites in this loop. Thank goodness our camper pad was paved. We would have headed back to Huntsville if it was all mud and puddles, too! 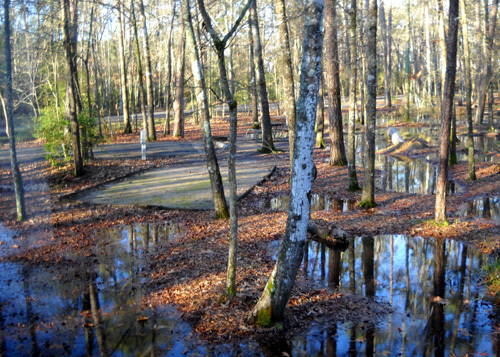 The other three loops, which have sites that are better suited for travel trailers, 5th-wheels, and motor homes, were just about as swampy as Hercules. Other than that, we probably would have been happier in one of those. 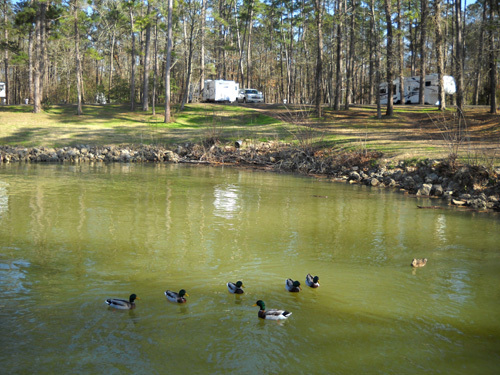 Only about 20 of the 147 RV sites in the park have a glimpse of the lake. At Huntsville almost every site has a scenic lake view. 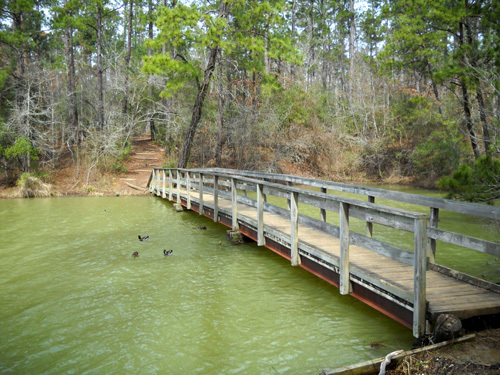 As it turned out, neither Lake Livingston nor Huntsville state parks were anywhere near filled during the holiday weekend because of the mostly cold, wet weather preceding it. We probably could have moved the Cameo to another loop at Lake Livingston on Friday afternoon when it was obvious there would be empty spots all weekend, but it just wasn't worth the effort it would take (in the rain) to move the camper for three nights. The other sites were waterlogged, too. We checked out the overflow campground, which was the only other option we had when we arrived, but the sites are very close together there (next photo). That's a good isolated area for group camping, however. We were surprised that TV reception was so poor at Lake Livingston; we don't have satellite service and cable wasn't available (it's rare to find cable at a state park). We weren't able to get NBC or ABC at either Huntsville or Lake Livingston. The closest CBS affiliate is Bryan-College Station, which is west of Huntsville. We could get CBS off and on at Huntsville, but not at Lake Livingston, which is another 50 miles farther from Bryan-College Station. I don't know why larger Houston stations don't serve either Huntsville or Lake Livingston state parks. We had about the same level of Verizon service (1-2 bars) at Lake Livingston as at Huntsville. Our slow broadband internet connection with the cell phone left a lot to be desired in both parks, however. It's much faster when we have 3-4 bars. At Huntsville SP Jim often drove less than a mile from our campsite to one of the WiFi connections in the park when he needed a high-speed connection on his laptop. We didn't have that option at Lake Livingston. 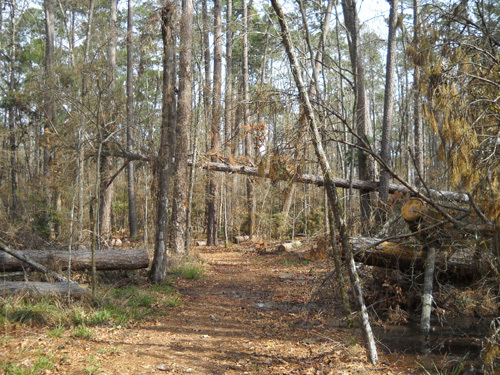 When the sun finally came out on Saturday, the Piney Shores sites by the lake were taken. 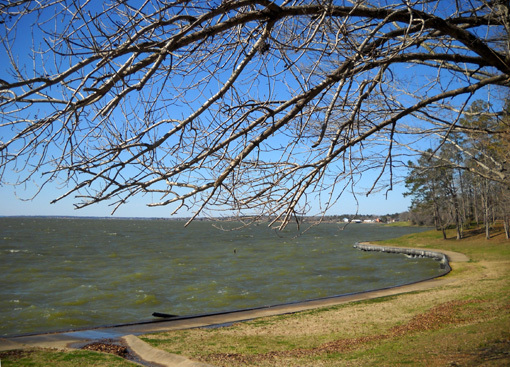 Lake Livingston doesn't have a weekly rate in the winter like Huntsville does. There are nice bathrooms with showers in each camping loop and one dump station for RVers who stay in sites without sewers. The park entry fee at Lake Livingston was only $3/day, the lowest price in the Texas State Park system. Entry was free with our parks pass and we were able to use a half-price coupon for one day of our camping fees. Lake Livingston is very popular with anglers. The Trinity River white bass run in January reportedly attracts thousands of visitors. According to the state park guide, catfish are plentiful and flatheads as large as 114 pounds have been caught there. That's close to the world record of 123 pounds for a flathead catfish. Fisher-folks can also find crappies and perch in this lake. 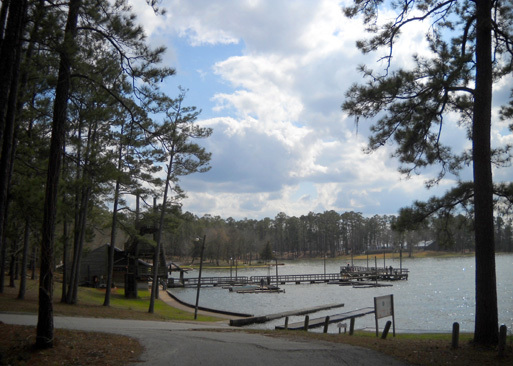 The park offers boat ramps, fishing piers, fish-cleaning shelters, and a seasonal (March-October) marina and store (below) with bait shop and gas. 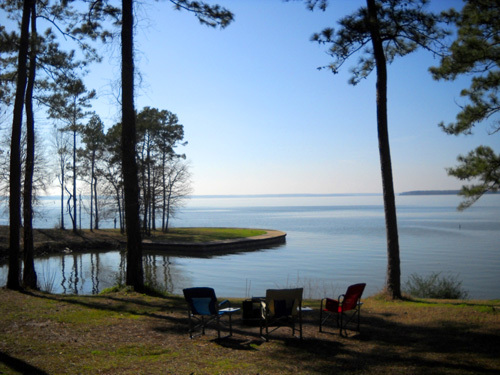 Boaters and paddlers also enjoy the large expanse of water at Lake Livingston. That's lake water in the foreground, above. The concrete "sea wall" and walkway almost make it look like a pool. The riders were just leaving the stables and turned off onto muddy trails just up the road. 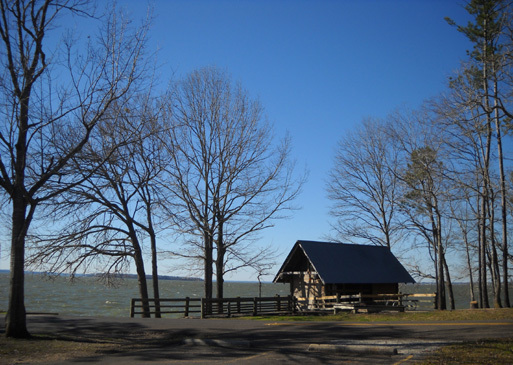 Lake Livingston has some nice picnic areas in grassy areas above the lake or in the pine and hardwood forest that covers much of the park. There are also paved and dirt paths along part of the lake shore. I've shown several of those in pictures above. I was surprised how slanted and rickety one of them was, wondering when someone would fall in the water and sue the park for negligence! Various other things I observed on walks and rides around the park indicate a lot more time and money are needed there to bring this park up to speed with the other ones we've visited. It really needs some volunteer help. Even on sunny days there was quite a bit of wind when we walked along the lake -- enough to cause whitecaps on the waves. That would feel good in the summertime but it made for some brisk Febu-ugly walks. The average temperature for this area is about 65 F. in mid-February. Only two of seven days we were at Lake Livingston got into the 60s. The rest topped out in the 40s or low 50s. Most days rained while we were there. One day we had sleet. Huntsville and Bryan-College Station, which are about the same latitude, got snow that day. Lake Livingston SP apparently enjoys some "lake effect" temperature moderation since it's on the eastern side of the water. pitched tents here on the weekend! The girls appeared to have fun anyway. As much as we mumbled to ourselves about the cold, wet weather, we still had it much better than the East and Southeast -- that's where our crummy weather system headed next, and apparently got much worse. We knew better than to complain to friends and relatives in areas that were hard hit! According to one evening news report we watched, that huge winter storm left snow in parts of every state except Hawaii -- and another one was right on its heels! The Philadelphia, Washington, DC, and Baltimore areas got four to five feet of snow that week. The federal government was basically shut down for several days. Roanoke got slammed with 15-18" of snow again. Our Ohio relatives fared better with "only" 8-12 inches of the white stuff. Dallas, TX set a record with 12" of snow. Parts of the southern U.S. that haven't had snow in two decades got up to 5". Freeze warnings extended through Florida . . .
What a winter it was in some parts of the country! Ironically, friends up in Maine had a much milder season than average. That helped our friend Eric maintain his peak-bagging quest of New England mountains all winter. Yeah, it's chilly but hey! The sun is out!! Our spirits were finally lifted during the Presi-Day weekend when the sun came out on Saturday afternoon (above) and Sunday morning. We enjoyed seeing everything in a different light, so to speak. At that point, sunshine was more important to us than warmth. 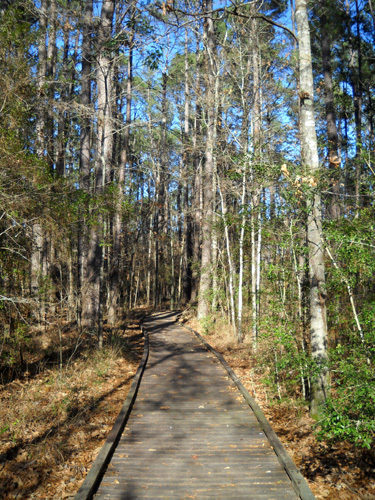 We enjoyed Lake Livingston so much more when it was sunny, although we still couldn't use most of the dirt trail system. 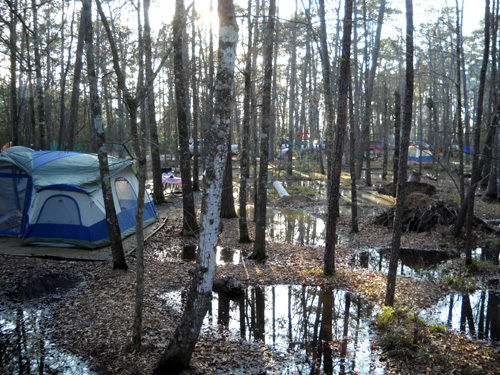 Our campground loop was full of Boy Scouts and families with kids; they had to be real careful where they pitched their tents but the kids enjoyed splashing around in the puddles when the adults weren't looking. About a third of the RV sites remained empty in the other loops. By Sunday afternoon most folks in our campground left as the clouds and wind increased. The other campgrounds were only about half full despite the holiday on Monday. 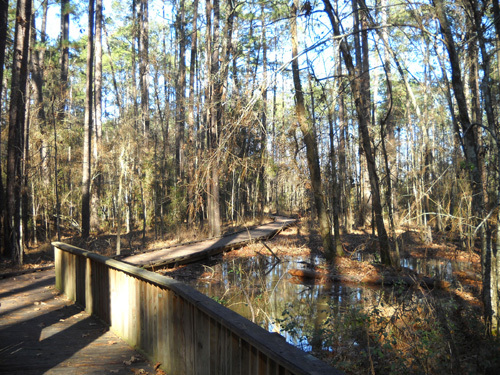 There are about seven miles of trails in Lake Livingston State Park. 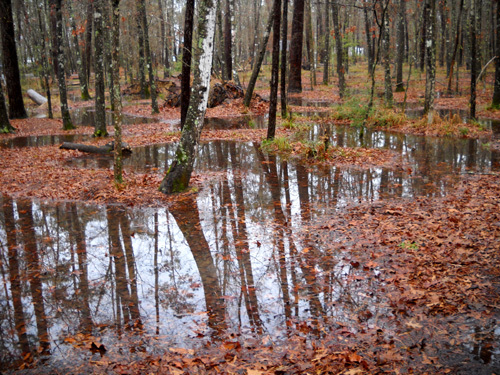 Because of all the standing water and mud from previous rainfall and all the additional rain that fell while we were there, we were able to effectively use only about three miles of the trail system and even that was an effort. 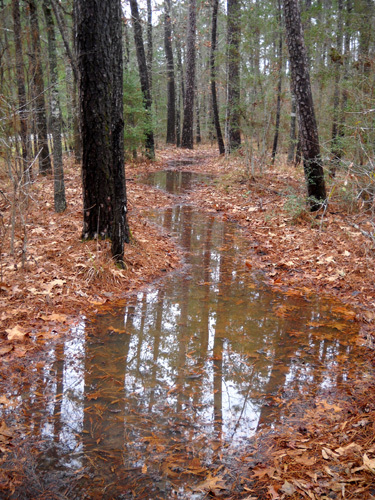 The trails are reportedly much drier in the summer. Gladly!! The trail is a creek right now. Cody thoroughly enjoyed all the standing water, of course. No one has more fun in puddles, creeks, and lakes than he does! He's pure Lab, built for paddling. 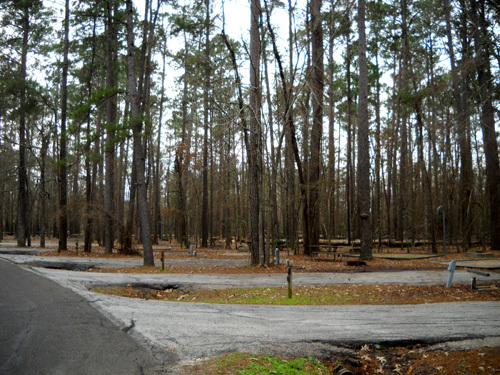 and there are about three miles of roads through and between the campgrounds, picnic areas, boat ramps, and park entrance. There are offshoots to a butterfly garden and frog and duck ponds. There were several exhibits (one is above) along the nature trail describing the ecosystem -- the trees and other plants in the combination wetland/woodlands, birds, butterflies, mammals, amphibians, reptiles, and the disappearance of wetlands across the country. Several multi-use dirt trails intersect with this loop but all were impassable due to standing water and mud. Much of this park is heavily wooded, which makes it a fairly cool place to camp in the summer. 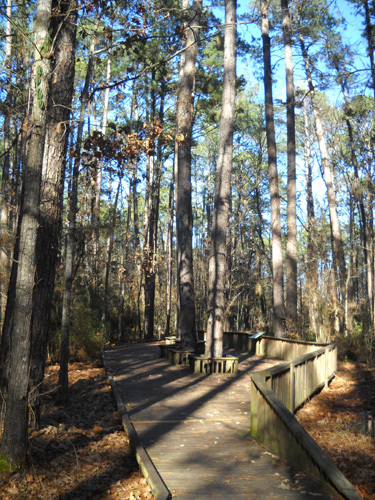 Loblolly pines and water oak dominate this section of the Pineywoods Region. I was surprised at the large number of huge trees, mostly shallow-rooted pines, that were uprooted throughout the park (above). Most were cleared from the trails we ran but some places still looked like quite a mess. I never did ask if it was from Hurricane Ike or the inordinate amount of rain they had this winter. The needles were still green on some of the trees, indicating they came down more recently than Ike. We also saw many 10-16" diameter tree trunks in piles, stacks of limbs here and there, and large limbs used as rip-rap to prevent erosion in the coves along the lake. These tree trunks were in our "side yard." There were also a fair number of trees lying in the water along the banks right where they had fallen, their roots washed clean. Even though the lake is dammed and the water level can be adjusted, it appeared to be pretty high. We're guessing there's been enough flooding downstream recently that engineers have to be careful about releasing more through the dam. The wildlife is similar to that at Huntsville SP. I saw very few mammals or birds out and about at this park, probably because of the foul weather. I saw ducks (below) but no shore birds like herons and egrets, which live at nearby Huntsville SP. Too foul even for fowl? They were probably down closer to the Gulf. We were quite happy on President's Day to pack up after lunch and head back to Huntsville State Park for another 2+ weeks. In retrospect we should have taken the risk of staying there, considering the lousy weather and the likelihood of people canceling their reservations. But we didn't know that at the time and didn't want to have to spend the holiday weekend at WalMart!